Human activities have led to degradation of many important ecosystems, giving rise to biodiversity loss and many other environmental problems. One response to worldwide ecosystem degradation and biodiversity loss has been the development of a management approach called payments for ecosystem services (PES). PES has been implemented by governments, the private sector, and non­-governmental organizations. PES programs aim to reduce human impacts on ecosystems by providing incentives directly to resource users so that they may engage in more environmentally desirable actions in context of socioeconomic, demographic, and cultural conditions. To investigate benefits of PES to biological conservation, the Lewsion lab collaborates with a team of scientists and researchers working in the U.S. and China through the interdisciplinary, multi-institutional project “Impacts of Ecosystem Service Payments in Coupled Natural and Human (CNH) Systems” (PI, Dr. Li An, Geography, SDSU). We use the endangered, endemic Guizhou snub ­nosed monkey (Rhinopithecus brelichi), the flagship species in Fanjingshan National Nature Reserve, Guizhou, China and other wildlife of conservation concern to assess effects of PES on wildlife. ​We apply camera trapping and occupancy modeling combined with remote sensing images to investigate responses of golden monkeys as well as other medium to large vertebrates to environmental characteristics (e.g. canopy fractional cover, vegetation composition and structure) and human activities at areas with implementation of payments for ecosystem service, near farmlands and in natural forests. 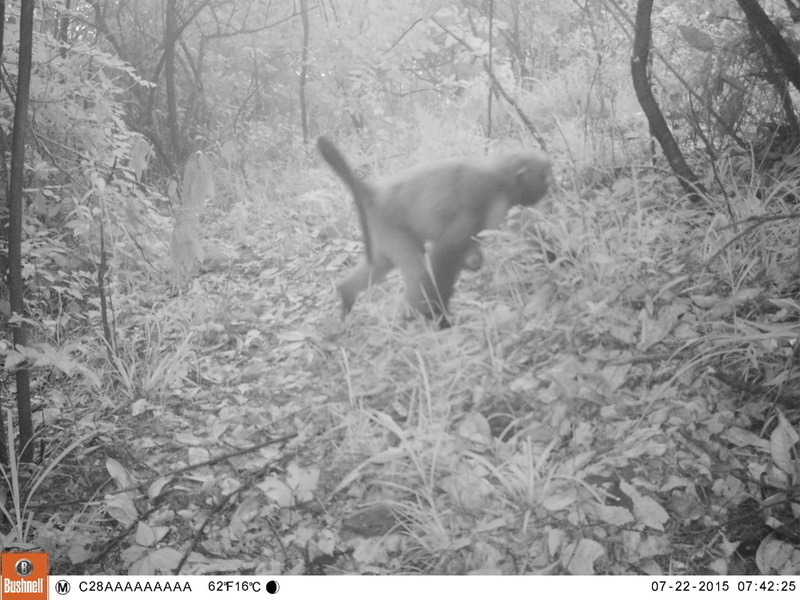 We have established 71 camera sites and detected 18 species of medium to large mammals and birds, including the golden monkeys. Among 18 species of wildlife, 10 species are either protected in China or listed as endangered, vulnerable or nearly threatened on the IUCN Red List. ​For each camera station, we established a 20 m x 20 m plot to measure and record variables related to vegetation, landscape features and human activities (e.g. distance to villages, roads, cable car). Canopy fractional cover was estimated by digital hemispherical photography images taken at stations. We calculated species diversity and richness for ground, mid-story and over-story vegetation for each plot. Of the 79 vegetation plots we completed, 31 were identified as mixed evergreen and deciduous vegetation which is the dominant vegetation cover type within the reserve. In addition, 10 deciduous plots, 11 conifer plots, nine bamboo plots, and 18 evergreen broadleaf plots were completed. We work closely with the Administration Office of Fanjingshan National Nature Reserve (FNNR), China. FNNR hosts our visitors and provide all logistic assistance-hotel, local transport, guides, and field assistants. FNNR collaborators have extensive knowledge in local socioeconomic and environmental conditions, helping us plan and conduct fieldwork. FNNR also sent staff to SDSU and received training from researchers in our team in a variety of fields such as GIS and remote sensing, biostatistics, social survey methodology, camera trapping, and data analysis. Other organizations we collaborate include Academia Sinica of China, Yunnan University, China, middle and high Schools in China and San Diego. We aim to understand the reciprocal relationships between PES, humans, and the environment simultaneously. The project provides essential insights into explaining human behavior (demography, livelihood, and their relationships) under complex socioeconomic (e.g., PES) and environmental (e.g., forest cover, habitat) conditions. The study can substantially improve our understanding of environmental responses to human disturbances or policies such as PES and pave the way for an innovative methodology from a complex systems perspective, in which feedbacks between human demography, livelihood activities, the environment, and policy are integrated through a unique web-based participatory agent-based model.